I have had my eye on the Roberto Cavalli Leeds print since I first saw it. It is a beautiful blue and white print that feels very ceramics inspired to me. If you have not yet seen it, you can check it out here. When I saw this skirt at my local consignment shop, I knew it was the closest I would get to the ceramics inspired print! The lining on this full skirt is pictured above. Who doesn’t love lining with a print? This skirt is from Anthropologie. It still had the tags on it, like basically all of my consignment purchases. The skirt was originally $88, and I got it for $16! It’s perfect for spreading out like a princess while sitting (ha, ha!) or twirling (also, princess-like). Because the skirt is so full, I paired it with a simple v-neck t-shirt and a fitted jean blazer. As you can see above, I tried it out with red heels and navy blue flats. I liked both looks, but was drawn more to the blue monochromatic look. 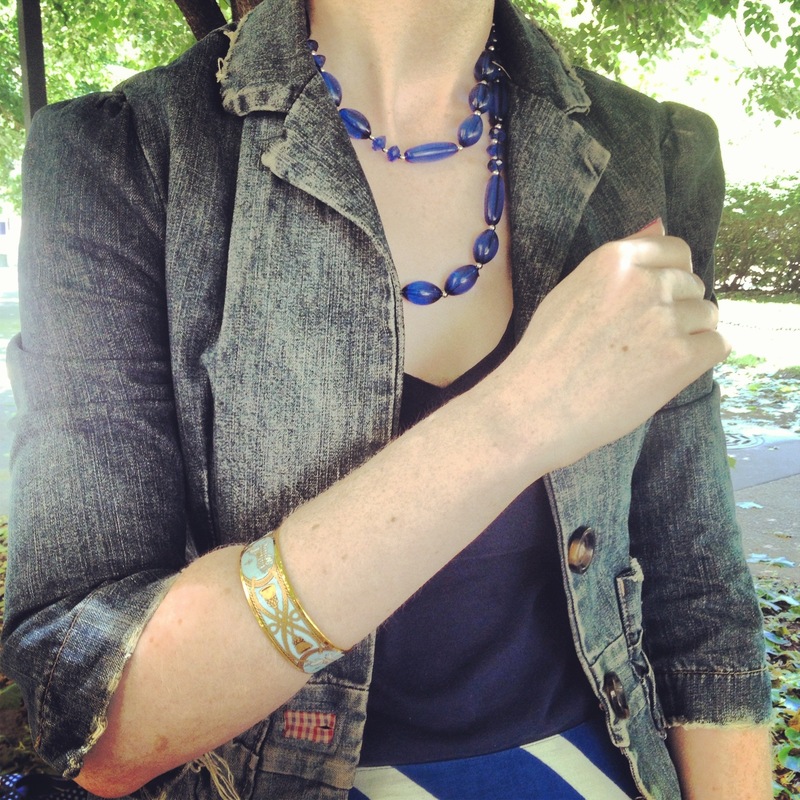 For accessories, I added a blue beaded necklace and an Hermes cuff. 1) I love looking through fashion magazines and checking out all of the haute couture. If you’ve seen the Devil Wears Prada, then you remember the scene when Miranda Priestly (Meryl Streep) explains how couture influences fashion all the way down to chain stores. Although the Roberto Cavalli prints are out of my price range, I was still able to find something that was at least reminiscent of the print. You can do the same! 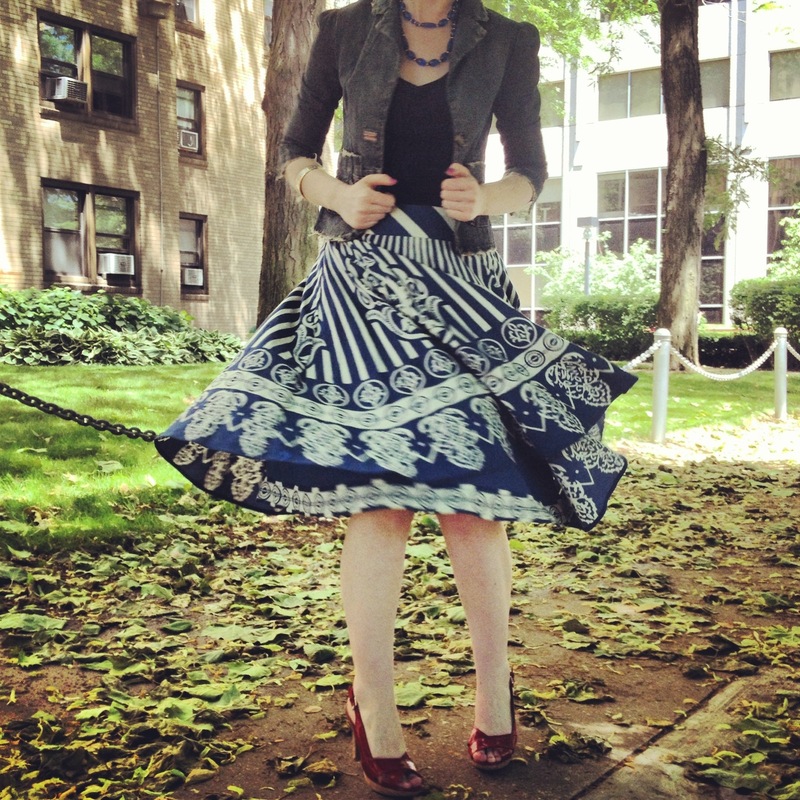 2) With a bold printed item, such as this skirt, keep the rest of the look simple. I love bold prints and full skirts! I kept everything else simple by creating a monochromatic look. I balanced the fullness of the skirt with a fitted shirt and blazer. Love that skirt! My last post was all about skirts! Another great outfit! I saw it! I love skirts too!!! It fits you well Fashion Huntress! I like it more with the red heels, I mean it looks better on you with the red heels. fabulous skirt and beautifully styled. Love it! OOOoooo…i LOVE that skirt…the mixed print in the one piece is gorgeous 🙂 And I love the contrast of red against blue!! Thank you!! I loved your look today! So many ways to mix and match blue and white pieces!! Such a fan of that skirt! Beautiful outfit! So glad I found it! Thank you!